Thanks to the power of the Piratebay I was able to watch the new Doctor Who episode (season six, episode two) only hours after it aired in Great Britain. Part of this two-parter was filmed here in the US of A. After the show I looked up Glen Canyon Dam because I had a feeling that I knew something about it. As mentioned elsewhere on this blog that I had been writing a flying blog before there even were blogs and so I thought this is a good opportunity to revisit that old story and put it into a proper blog. This one flight was supposed to be the biggest I had ever done. I had been up all the Pacific coast from Burbank to Seattle, but this one should go from home sweet home in Burbank around the Grand Canyon up through the Rockies all the way to the Canadian border, back to the Pacific Coast and then the rest of the trip that I already knew – down the coast to come home a hero. It did not quite work out that way, but it became a big memory nonetheless. 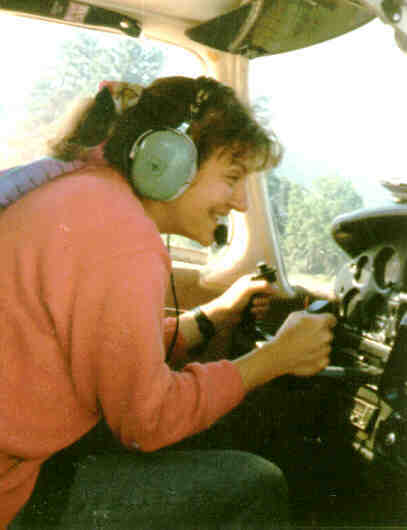 The flight was planned to be together with Griselda, a very good friend who was to come over from Germany for it. I was the designated pilot and she had to be the co-pilot in training. I intended not to disappoint the trust she just had to put into my flying abilities and so I really got into a thorough planning for the flight. It was clear that I needed some more survival kit than the average California flier has with him or her – the credit card, thus I invested into a real survival kit. 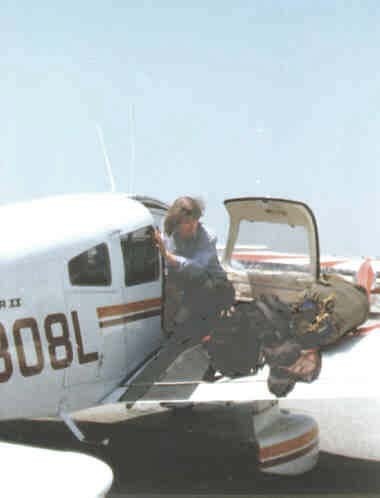 I also needed chocks and ropes for tie-down because there were some very desolated airstrips on our agenda. The idea of rolling up in a sleeping bag under the wing of trusty 08L on a grass strip in nowhere-land made chills going up and down my spine. That would be adventure! Naturally I learned everything I could get my hands on about mountain flying, but the uncertainty kept hanging around if I would be able to handle whatever would come our way. As with everything in flying you have to experience it first hand before you know you can handle it. But at least I got all the theoretical education to have the best cards possible. Playing them would show me if I understood the game. Griselda’s arrival date came and the first day I tried her acceptance for air work. I was happy. She would be a good co-pilot. She enjoyed being up there with the elements just as I did and seemed to have an inborn feel for yoke and rudder. The next day was the “Beginning of the Great Adventure.”We were up with the sun, which was very unusual, at least for me, and 08L was loaded with so much gear as she has probably never seen before. The first leg would lead us east across the Colorado River into Arizona to Sedona, the Red Rock Country. 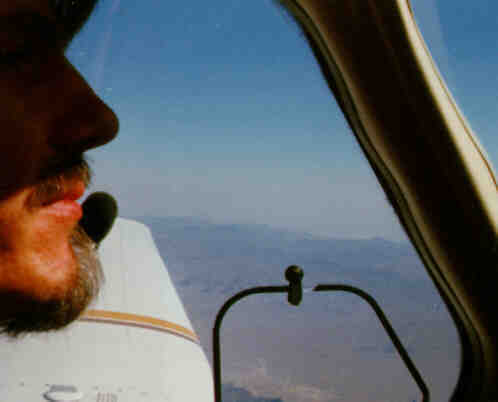 We get clearance from Burbank for the ‘Golden State’ departure, climb out to the north-west and are released to own navigation after leaving three thousand feet. This whole area is very familiar to me and I feel so at home that I do not need any navigation equipment but my eyes for this part of the flight. 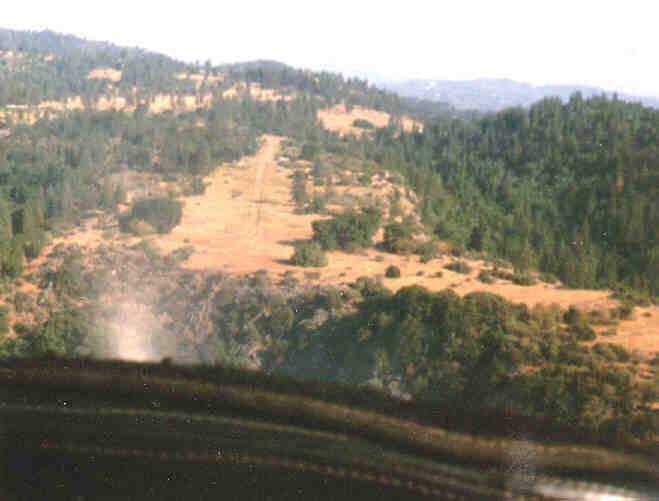 We fly towards and over the deserted airport of Agua Dulce. Already at over six thousand feet, the few planes left down there are the little toys that I played with as a kid. To be honest I am still a kid and I still play with my plane, the toy just became a bit bigger. The only thing I have to be careful with, is to look more serious about this flying business. If you are a grown-up, you are not supposed to play. You use the plane to save time, to arrive faster, to avoid the traffic jams. Right! So why then do I fly for a burger to the Elephant Bar in Santa Barbara? I guess if I think hard about it I will find an adult reason. But not now. Your heart will go fast for all the fun you had, but you look at your passenger with a serious expression, wipe the sweat from your forehead and assure him or her that we made it and that it was not that bad. So I am a naughty child, but please, I’m not so bad that I do this with a victim, excuse me, passenger who might really get scared. With Griselda I could definitely do it, seemed she enjoyed this game as much as I did. Now it is time to tune in some navigation equipment. We have all these neat things aboard to play with so we better use them. It’s Hector VOR first, then Goffs. We climb up to eleven and a half thousand feet and leave behind some bumpiness that developed over the desert. 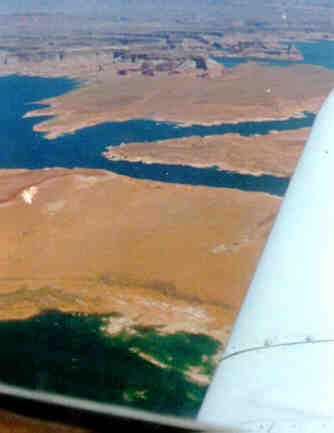 From this height we can already see the Colorado River ahead, how it cuts through the dead land leaving a band of green life crawling through the brown rugged wilderness. Yet this stays soon behind, we tune into the next vortac, I believe it is EED, and we enter the land of the baby Grand Canyons. They really look like it! Really, if you don’t believe me, go there and take a look yourself! Griselda has the yoke now most of the time. She sure has the time of her life. I can share her joy. There is nothing better than leaving the ego home, in the garage, together with the car, and just enjoy the happiness of a friend. Finally we tune into the Drake VOR, the last point before we have to trust our eyes only to find the destination. 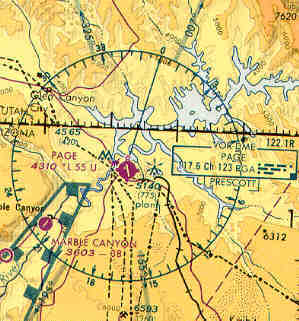 I might cheat a bit because I know that Sedona is thirty-four miles from the Drake VOR on the 063 radial, but hey, as a pilot you learn to always have an alternative. I have been to Sedona once before and I try to remember the topology and how all this looked the first time but I can’t really tell, so OK, I will cheat a little. And finally there it is. I recognize the high mesa, the big valley that looks like a huge sink-hole leaving the surrounding sheer cliffs of red rock that gave the country its name. And from the bottom of this empty pit rises an island that refused to go under with the rest of the country, and on top of it the Sedona airport. Dial in now the Unicom frequency of 122.8 and see if somebody is home to give us salute. But instead of the more appropriate “Yippee, we made it all the way from Burbank, California and we are so glad that we are here safely”, I have to bury the child for a little while and announce us as, “Cherokee 08L, five miles west, airport advisories please”. One last check on the maps. 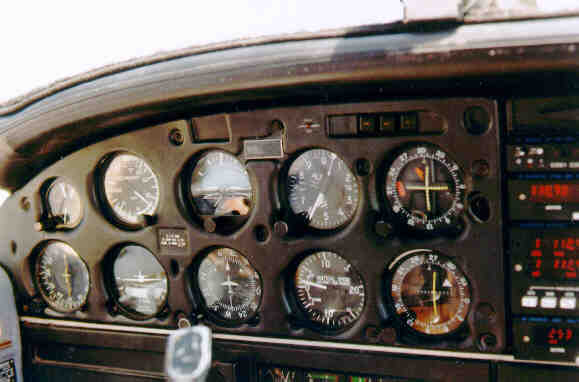 Wind is from the south-west, so we use runway 21 with left traffic, well setup in the pattern, nicely coming down, a landing I can be proud of, taxi to the tie- downs, shutdown radios, engine, electric …… Wonderful Silence! We made the first leg, and for me this feeling of accomplishment after a long flight never seems to wear off, even after doing it so often already. We had planned to stay just a day and then continue around the north-east corner of the Grand Canyon and north into Utah, but then it was so beautiful and Red Rock country gave us so much to see and experience that we decided to stay an extra day. This should become only the first delay on this trip with more to come. Armed with that, we finally got up in the air at about eleven, and yes, the air already had started on its way up and down and up. In other words, I was to fight turbulence for all this leg. For me this is mostly only uncomfortable during the first half hour into a flight. After that the body, who is the one screaming “I don’t want to die” either gives up or learns that the danger is not so eminent as it believed. I still have to work hard to keep the pointy part of the plane forward and the dirty part down after these first thirty to forty minutes but at least nobody is dramatizing that death is unavoidable, sudden and very painful. I was amazed by Griselda’s attitude towards this kicking around. She seemed to actually enjoy it. And the bad boy that I am, I kept her ignorant about the fact that I probably would not know how to properly react should we get kicked inverted. But it did not happen and after I got used to the permanent jolting I also started to enjoy the trip. 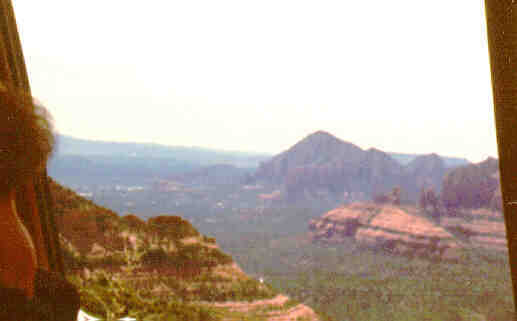 … in the Sedona valley that look like forgotten teeth in the mouth of a Greek grandfather. I mean they look much more impressive than that but the form reminded me (and I try to be a bit poetic here – so bear with me please). Now we are heading north north-east towards the eastern edge of the Grand Canyon. VOR receiver 1 is tuned to Page (PGA, 117.6) and the first time in my flying career my finger uses a CG chart to follow the flight path. Sectionals are just too cumbersome for all these long stretches of flight. From this vista point we have a breathtaking view into and along the first part of the Colorado’s journey towards the Hoover Dam where he will be able to rest again. Our journey also goes on, we are turning west and head to our next navigation point, St. George. This is a new state for me, I have never been to Utah before. Either the turbulence has diminished somewhat or my acceptance for them grew bigger, but I can enjoy the landscape we cross much more. To our left are side valleys that strive to reach big brother Grand Canyon, and to our right looming rugged mountains that make us look so small sitting behind our propeller with the intention to conquer them. No, not defeat them, just have a little competition. Our destination for today lies straight north, but this is the first concession we have to make to this one big mountain – we have to go around him, he will not let us climb straight over him. But we do not mind, the trip is the adventure, not the arrival. Nearly arriving at St. George, we consider to interrupt our journey but the tanks are still half full and we are challenged by the big valley that opens to the north and which we decide to follow on our way into the northern states. Without any experience in flying in these big mountains that are everywhere, we really have to trust our navigation equipment. Once we have turned 08L’s nose into the right direction the view again agrees with what we expected to see from looking at the map. 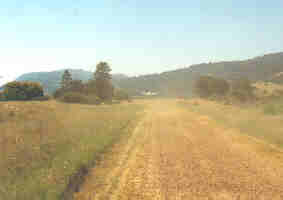 So we follow the valley northbound, tuning in Cedar City VOR and then Milford. 08L, always the nose up a bit, working her way through the rising terrain. We will not be able to make it to Salt Lake City with the remaining fuel, but with a feeling of accomplishment from our first encounter with the Rocky Mountains we finally tune in to the Delta, Utah VOR and decide to land there, give 08L to eat and also feed us and finish the flight for today. How could be know that we would get to know Delta, Utah very well. Finding the airport is no problem at all. 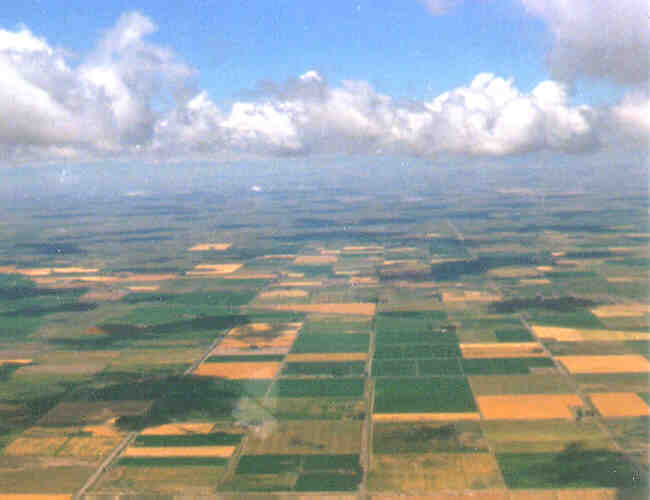 It lies in the middle of a huge valley, flat as a board, checkered with fields, but surrounded by high mountains. 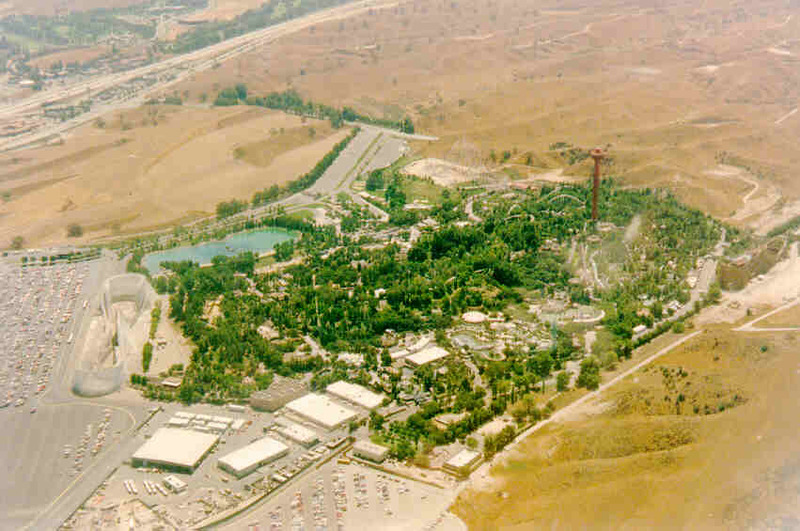 Just two thousand feet above ground we can see our destination for miles. 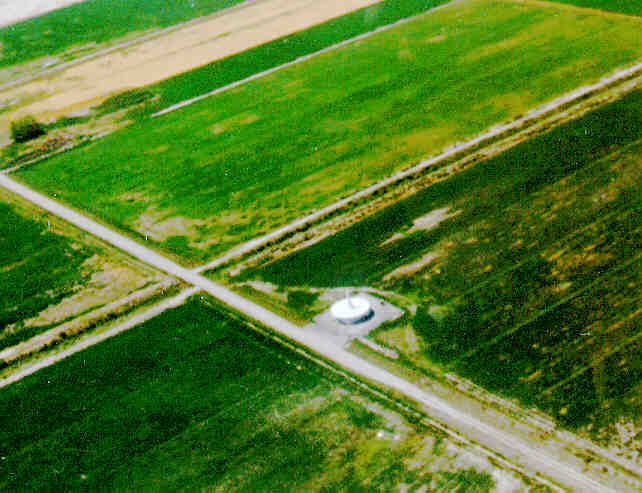 The field is completely deserted, the owner of the local crop duster business doubles as the local FBO and we call him to come back from town to help us with food for 08L. We hitch a ride with him into town and realize only then how lucky we were that this town actually has a hotel and that this hotel even has rooms for us. With the feeling of pride for getting here – Columbus could not have felt better – we go for Dinner and do not think too much of tomorrow’s flight. We only know it will go north, past Salt Lake City and well into Idaho. As I wake up the next morning, ready for more mountain flying, the day on the other side of the curtains looks suspiciously dark. Crawling out of bed and peeking out of the window into a very cloudy sky, it slowly trickles into my still sleepy mind that the weather in the mountains in fact changes very fast – just as I had learned in all my theoretical studies about mountain flying. OK, so yesterday it was the clearest weather I ever saw, today the clouds hang definitely low, but it should also change back to the real weather quickly! But flight service can not confirm my hopes. It looks as if this weather will stay with us for a while. I don’t actually consider going IFR. 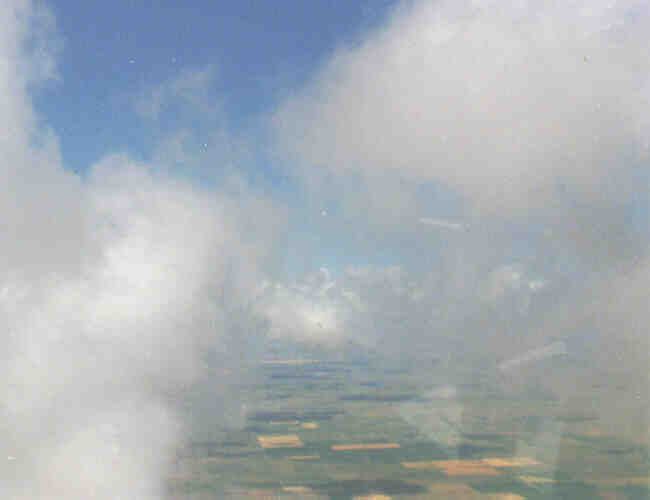 We are in an area where the numbers along the lines of the low altitude IFR charts [Editor: this is the minimum altitude that you have to fly when on these air ways] are bigger than the numbers in the handbook after the entry for service ceiling [Editor: the altitude the plane can actually reach before the air gets too thin]. Drilling our way through the gray masses into the blue and into freedom is not an option. There is a family restaurant just outside the hotel which does not know that it will become our head quarter, and there, over breakfast, Griselda and I discuss our options. There are not that many. But first we should get a car and check out the area. It’s cloudy, but the weather beneath them is quite decent. And Delta, Utah even has a rental car company. Unfortunately they are out of cars – tomorrow one is expected back. Happy people as we are, we enjoy MTV, talk about the good old days and have all the time in the world to write to our loved-ones left at home. We are still certain that it will be just a day that we can relax and it will do us good. Isn’t that strange? The times when you trust the weather forecast, you should not have, now I didn’t trust it but I should’ve. The next day looks pretty much the same. At least around noon we get our car and thus some mobility. The first trip is out to see how trusty 08L is doing. Under the cloud deck it’s pretty good flying weather, so we go and check out the area from the birds view to get an overview. 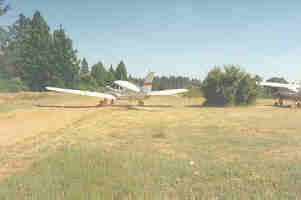 Griselda does a take-off nearly without assistance. She really has a feel for flying. … of the clouds and then just drill a hole into them. Soon we leave the last clouds behind us and point the nose towards Las Vegas. Still around some mountains, but the general direction is the City of Blinking Lights. The trip back seems to be a lot shorter than the way up here. A bit over two and a half hours bring Griselda and her pilot into Las Vegas North Terminal for some food for trusty 08L and the people traveling with her. This is the first airport where I see a self-service gas station for aviation fuel. It’s pretty cheap, under 1.80, [Editor: those were the days…] but we get the idea that, as we go up into the restaurant and have a crew prepare and serve our lunch, so we could also have some crew help our 08L to get fed. I am still wondering how she would have handled the self-service all by herself. After lunch we call Ron up in Badger. Yes, he is there and we are welcome, just buzz the house and we pick you up at Jerry’s airstrip. Jerry is a great guy. I met him a couple of years back when I was still on my primary training. 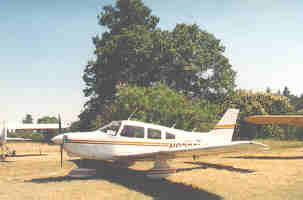 A native Badger and retired army pilot, Barney, had been happy to have a pilot, even if it was only a prospective one, whom he could show around and introduce him to the people in the area who had something to do with flying. Jerry was one of them. He was over seventy and lived up there in the woods with his wife Lucy. 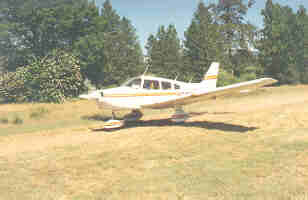 The one item he was most proud of was the wooden propeller on his ’49 Bonanza, that he still regularly flies out of his 2200 foot private airstrip at 4000 feet elevation. 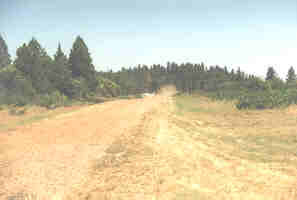 This was the air strip Griselda and I would go into. But first we had to find our way over the Sierra Nevada. These are high mountains! From Vegas we have trusty 08L’s nose up into the sky all the time. Finally we reach about 12000 feet and there just isn’t any more altitude to win. It’s pretty hot and density altitude is probably a lot higher. We can’t quite make it along the straight route to Porterville. A pretty big guy is in the way. The sectional gives his height away with far over 12000. Respectful as we are, we bid him a hello and fly around. Once we have crossed the Eastern ridge of the Sierra, the highest part, we can start to let down. On the way down we have to dodge some very beautiful clouds that try to rise over the ridges of the Sierra to bring some rain to the desert hidden behind. But experience tells that they will not succeed. On the other hand this failure brings gorgeous green valleys in the higher up-sloping part of the Sierra on the western side of the ridge. 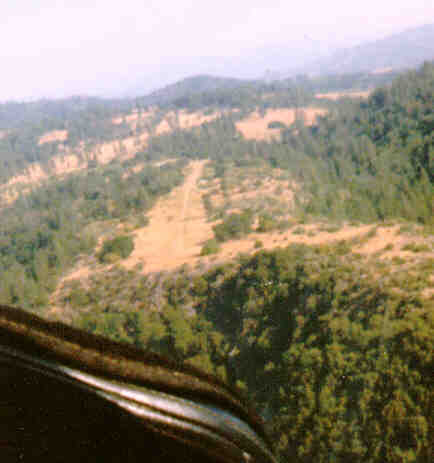 Eventually we intersect the one radial beaming out of Porterville North that will bring us right to Jerry’s airstrip. 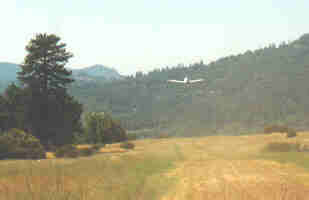 But before we get there, we go down some more and make our low pass over Ron’s place. This reminds me so much of the old barn stormer stories that I can nearly feel the wind blowing into my face in the open cockpit. But only nearly, good young 08L is not really drafty. 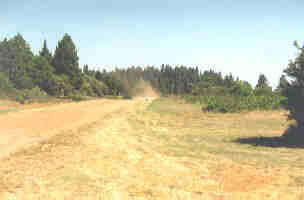 Climbing back up to 5000 again and see that we find the airstrip now. It’s not that easy. 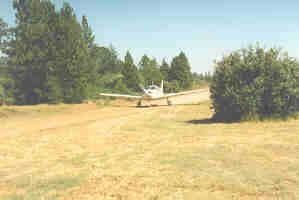 Finally we make it out, turn base and final and see this unbelievable small airstrip over the nose. 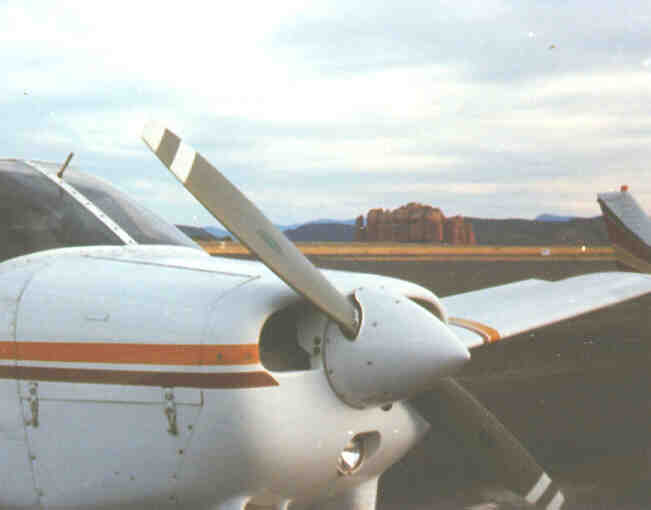 … power is cut and airspeed reduced as much as possible. It is not the best landing but we all get down nicely, in other words in one piece, Griselda is thrilled by the adrenaline flash, and soon we tie down our trusty girl for the night. 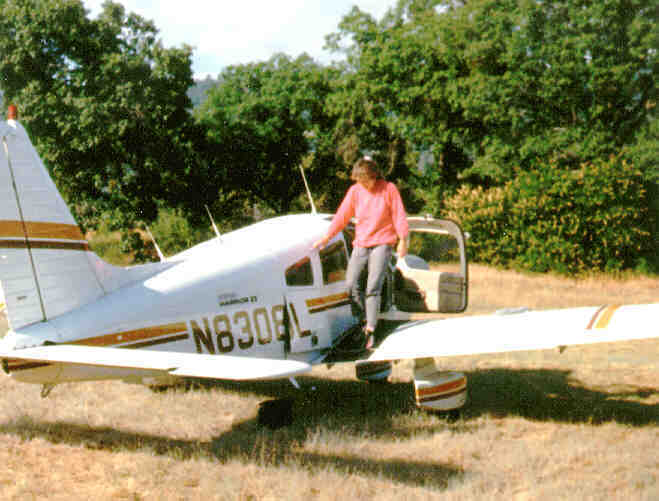 Certainly we have to make a photo of World Traveler Griselda leaving the plane before Ron comes and picks us up. With all this feeling on being on top of everything after the survival of the bigger part of the trip this World Traveler has to show off how she would have looked as the Ace Pilot in her Sopwith Camel. We have a great day at Ron’s Badger Inn. The weather is as it should have been while we were stranded in Delta, Utah, but what’s the complains, we enjoy it now. The next day will bring this world trip to an end. After a good brunch Ron drives us back to Jerry’s airstrip and we first have a chat with him, Lucy and some friends of them who came up with a beautifully restored Piper Cub, this old nobility of general aviation. 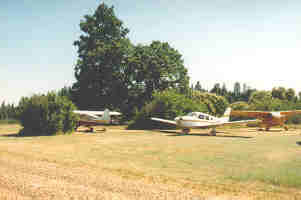 I first get dependable 08L from the place where she slept for the night to the beginning of the air strip which coincides with Jerry’s yard. 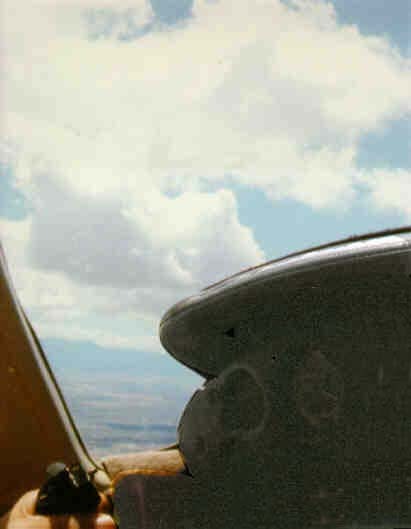 We turn her around to point down the runway, and I, trying to be the nice guy, waste a bit of this already short strip in order not to sand blast the Cub behind me. We wave good-bye, full throttle and down we go the strip, faster and faster. Only not quite fast enough when we nearly reach the end of the runway. But that’s not a problem for such an accomplished pilot as I am now. 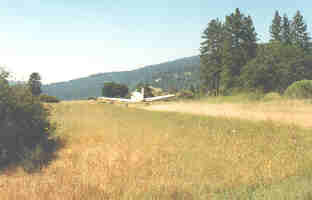 The runway is on top of a pretty high ridge and at the end of the runway the terrain falls off steeply for several hundred feet. I can use that! With under sixty knots one jump over the edge and nose down into the chasm. Not really that dramatic, only to gain speed through the dive. Getting the speed up to seventy, seventy-five and start climbing. No problem. Only the crowd that had us waved good-bye, had a different perspective. They looked down the runway. Trusty 08L reached the end and disappeared. 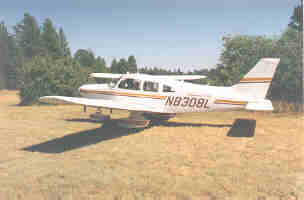 Ron told me later that all of them started to breathe again when we reappeared after our dive, flying over the strip, happy 08L rocks her wings and we follow the Dry Creek down to Woodlake, navigate to Porterville, get some gas there and embark on the last leg, climbing to over ten thousand feet to get over the Grape Vine, then slide down all the way from the Gorman VOR into the home port Burbank. Burbank Approach, Cherokee 08L, Magic Mountain out of six thousand, landing Burbank with Information Xray. 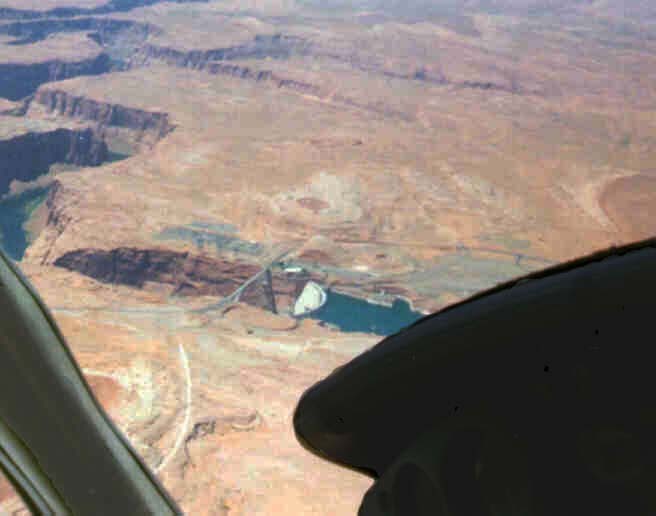 This entry was posted in Diary, Reminiscence, Stories and tagged air plane, airstrips, co pilot, cross country, dirt strip, flying, glen canyon dam, grand canyon, grass strip, rockies, survival kit on April 30, 2011 by Merlin Silk.